If you're in dire need of a tablet, Walmart has a great deal on Apple's 9.7-inch iPad (5th Gen), but you'll probably have to hurry since these deals tend to disappear quite fast. We've reported before about a similar deal that the US retailer offered customers last month, but if you missed it, here is your chance to score a cheaper Apple iPad 9.7-inch (5th Gen) slate. First off, it's worth mentioning the 32GB Wi-Fi Apple iPad (5th Gen) usually sells for $330, but some retailers have it available for $300. These prices change rapidly as US retailers try to remain competitive in the tablet market, which is great for consumers. 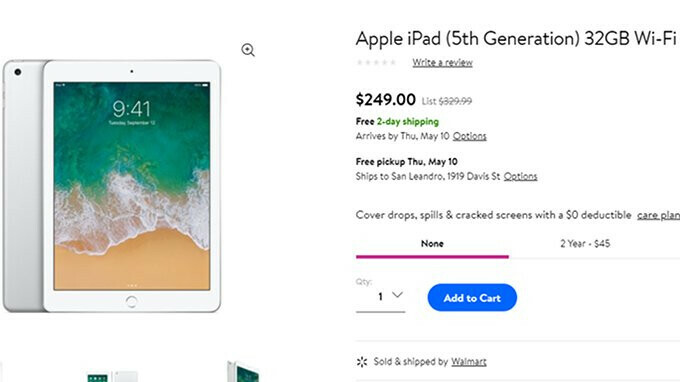 In any case, Walmart is now selling the 32GB Wi-Fi version of the 9.7-inch iPad (5th Gen) for only $249, which means you could save $80 when you buy. Of course, some would say that you only save $50 since many retailers sell the iPad for $300, but even a 15% discount is decent for an Apple product. Customers who decide to go for Walmart's deal may also benefit from free 2-day shipping. It's also worth mentioning that you can get the 9.7-inch iPad (5th Gen) in either silver or gold colors, as the space gray model isn't on sale. With Minecraft graphics on the A9. Im getting the 2018. Btw it's been 250 since the new version so this isn't new.